It's a RIDICULOUSLY common problem! I receive A LOT of e-mail from people asking for language learning advice - probably about 50 messages a day. I've never done the math but I'd guess that about 50% mention having a fear of speaking! And probably even more have it but don't mention it. A very, very small number of people are naturally so confident and social that this isn't a problem! 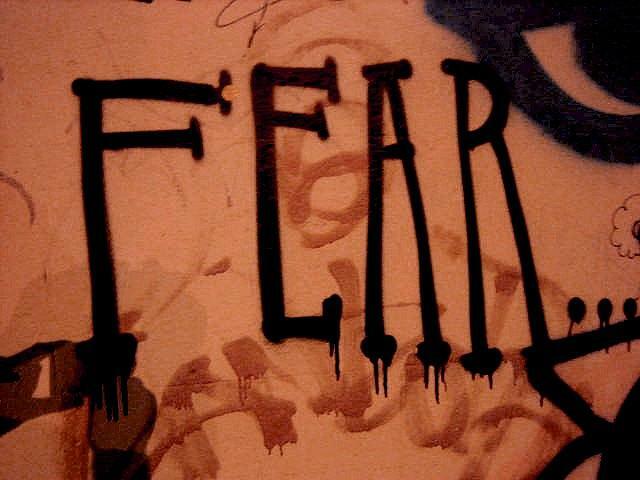 However, the vast majority of us must overcome this fear - especially when learning our first foreign language. I personally had to struggle with this fear when I was learning Polish. For me the process took years because I DIDN'T KNOW how to do it! In most situations I avoided saying very much and I constantly worried that I'd make some terrible mistake and everybody'd laugh at me. However, after a while I discovered that I could talk sort of comfortably with certain people. Not with everyone! But with a friendly enough person in a comfortable situation. And you know what? I made many mistakes - VERY many mistakes. ;-) But I realized that it wasn't a big deal. The world didn't end. Slowly the fear subsided when talking with these friendly people. And as my confidence grew, I made fewer and fewer errors. It turns out that you speak better when you aren't worrying about it! The best place to conquer this fear ISN'T in a foreign country! Many believe it's best to be in the country where the language is spoken, because there you are forced to speak. In a way this is true. There are many situations, for example, in the USA where you can't get by without speaking English. However, if you're really afraid to speak, you're going to avoid the situations where you're forced to speak. In fact, those situations are sometimes so uncomfortable that they can even be traumatic! You can best take advantage the language learning opportunities in a foreign country AFTER you've gotten over your fear. ... in the most comfortable place in the world: At home! Using the tools like Skype and Mumble, you can use the internet to practice speaking with people from all over the world. Find a language exchange partner or a teacher, who is very friendly and you are comfortable with. This may take several tries! Create the most comfortable situation possible. For example, plan the topics of your meetings in advance so you feel ready for them. Talk as much as possible! With each meeting you'll become more and more comfortable and confident. Over time that confidence will extend to more difficult situations! If you're learning English: meet with my wife and me! For over 3 months, we've been offering paid meetings over voice chat to English learners. 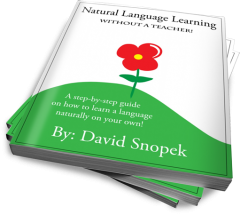 The original purpose was to help independent language learners maintain their motivation, which can be difficult when you're learning on your own. However, we quickly noticed that these meetings helped the participants make HUGE progress in overcoming their fear of speaking! "This makes it increasingly easy for me to overcome my anxiety associated with expressing myself in English. What's more - with each meeting I'm more motivated to continue learning English, which is why I encourage everyone who wants to learn this language to participate!" We meet twice a week in a small group for a one hour conversation in English. We try to create the most supportive and friendly environment environment possible. We'll never laugh at you for making a mistake! It only costs 11.87 PLN per meeting! And if you join us on the premium meetings, you'll also get access to our English course Real Life in the USA for FREE (usually 49 PLN)! Last week we talked about setting your language learning goals for 2013. If you still haven't decided on a goal, why not conquer your fear! Are you afraid to speak the language you are learning? Or have you defeated it already? If so, how? If not, what's standing in your way? Please write a comment below! Yeah, absolutely! Once you get over your fear of speaking you'll have a whole lot of new learning opportunities and awesome experiences. :-) Please let me know how it goes! I ran into a funny situation last night. I realised that when I try to say french words while holding a conversation in English I tend to 'americanise' my pronounciation. The added idea that my pronounciation and accent are so off results in more speaking anxiety. It's like I can't switch my tongue to a more neutral or french accent without warming it up first. On the bright side I did go to Quebec city two weeks ago and after my initial deer in headlights experiences with being surrounded by only francophones and wanting to cling to English(one who was particularly rude) I convinced myself that I would for at least one excursion overcome my anxiety to at least exchange some money at the bank. It took a lot of self pep talk beforehand and maybe it is only 2-3 phrases I had to come up with but I successfully managed to do the exchange only in French and ACTUALLY was understood. Still anxious about speaking with my boyfriend (it's predominantly over skype) but I think that's more to do with expecting too much too soon of myself which makes the situation more stressful. Thanks for sharing your story. :-) I also have lots of problems with switching languages and it takes me some time to warm up to each language. I even need to time warm to English (my native language) after I've been speaking Polish for a while. That's awesome about your experience in Quebec! If you keep slowly increasing the frequency and length of your French attempts, I'm sure you'll get there! I found this thread by googling "tips to warm up quickly in a foreign language" . I have to go between English and Portuguese a lot & I need a minute to warm up in Portuguese. Then when I have to go back to English (I'm English) I seem to lose lots of words & continue speaking to English people in Portuguese! Like it takes time for the dictionary to load. If it's just one other person then it's no issue - but if there are a few people you can suddenly forget everything! Yup, completely agreed, I've been saying for years now that I think the single most useful resource for a language learner is a language exchange site (plus skype, of course). You can even start off easy by sort of doing it "half way" by chatting with natives in Spanish first and then moving on to actually talking to them in real time via skype. BTW, do you have a favorite language exchange website? I quick searched on your blog and couldn't find anything under "language exchange" (hint, hint - maybe it's time for an article! ;-)). I'm always looking for more good ones to recommend. Er, actually on second look it appears to be part of the "bribe" for signing up for your mailing list. :-) I never did it because I'm not learning Spanish, but I just decided to give it go out of curiosity. Yup, I've been meaning to do an article on language exchanges for a long time now, it's just a time issue (I'm spending almost all my time right now on my book). By far the best language exchange I've tried (and I've tried most of them) is iTalki, hands down. Seriously, go there first before you try anywhere else. "1. The Mixxer - This is the largest, most popular, and, in my opinion, best language exchange site out there. Start with this one." In any case, there were a few in the e-mail that I didn't know previously! Great stuff, thanks! Yup, that's old, I need to edit that. I need to update my whole e-mail series but I'm spending all my time on my book right now. Thanks so much David, I will definitely be looking for people (mostly fellow language learners) to review rough copies before it's published, I will definitely talk to you then. No clue on when it'll be ready, a few months at least. The potential publication date keeps getting pushed back over and over as I find more stuff I want to add or change, haha. Again, thank you, I mean it. People always have the idea that you have to be in the country to speak to a native speaker, but technology has made it possible for us to sit at home and speak to a native whenever we want. You forgot to mention Verbling, this site has speaking practice on demand. Also I didn't know about Mumble before thanks for that. Absolutely! BTW, I took a look at your blog - looks interesting! I love ninjas. :-) It's great that you have multiple contributors who are learning different languages. You can cover a lot of ground that way! Thanks and I've subscribed to your feeds too. Great content, great blog and great teacher also ! I`m not afraid to speak in english. I know a lot words and it`s make me confident. I do a lot of mistakes, but it`s not problem for me, beacause I`m still learning and I know the people can understand me. If I will be in England I will not have problem with communication. Does not scare me. That's really great that you don't have a fear of speaking English! Congrats! I still have a fear of speaking Polish in certain situations. :-) But I'm good in most of them now. If you want to be more confident and wise in learning foreign languages you must first know the purpose of learning. Learn Bahasa Indonesia Ubud is good for me which I am able to interact with the locals effectively. However, learning bahasa you’ll be a bit particular with accents and stresses on each word. If you are going to learn other languages you must be confident enough and know the reason why you are going to learn a certain language. I have my Ubud Indonesian teacher where instructors are very passionate to teach their students about Bahasa Indonesia. Through this, I’ve learn a lot especially the correct use of grammar, phrases, and vocabularies and also in speaking wherein I am able to communicate with others.